What are Tulare cherries? A cousin to the popular Bing cherry, Tulare cherries are prized for their sweet, juicy flavor and firm texture. Growing Tulare cherries isn’t difficult for gardeners in USDA plant hardiness zones 5 through 8, as Tulare cherry trees won’t tolerate extreme heat or punishing cold. Read on for more Tulare cherry information. Tulare cherry trees originated completely by chance in California’s San Joaquin Valley. Although they were initially discovered in 1974, these cherry trees weren’t patented until 1988. Like most sweet cherries, these attractive, heart-shaped fruits are ideal for nearly any purpose, from eating fresh to canning or freezing. You can also incorporate them in a number of savory or baked desserts. 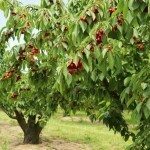 Caring for Tulare cherry in the home landscape is a relatively easy endeavor provided you follow a few basic tips. 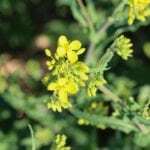 Plant Tulare when the soil is soft and moist in late fall or early spring. Like all cherry trees, Tulare cherries require deep, well-drained soil. Avoid poorly drained areas or locations that remain soggy long after a rainfall. Healthy blooming requires a minimum of six hours of sunlight per day. Avoid planting where the cherry trees are shaded by buildings or taller trees. Allow 35 to 50 feet (10-15 m.) between trees. Otherwise, air-circulation is compromised and the tree will be more susceptible to pests and disease. Provide the cherry trees with about 1 inch (2.5 cm.) of water per week when they are young. The trees may need a little more moisture during dry periods, but don’t overwater. Mature Tulare cherry trees need supplemental water only during extended dry periods. Water carefully to reduce the risk of powdery mildew. Water at the base of the tree, using a soaker hose or drip irrigation system. Avoid overhead irrigation and keep the foliage as dry as possible. Provide about 3 inches (8 cm.) of mulch to prevent moisture evaporation. Mulch will help control growth of weeds, and will also prevent temperature fluctuations that can cause cherries to split. Fertilize young cherry trees every spring, until the tree begins to bear fruit. At that point, fertilize yearly after harvest. Prune the trees annually in late winter. Remove winter-damaged growth and branches that cross or rub other branches. Thinning the center of the tree will improve air circulation. Regular pruning will also help prevent powdery mildew and other fungal diseases. Avoid pruning Tulare cherry trees in autumn. Pull suckers from the base of the tree throughout the season. Otherwise, suckers will rob the tree of moisture and nutrients, and may promote fungal disease.